Location: Host cell cytoplasm, replication/transcription occurs in membrane invaginations. Replication/transcription events: Positive stranded RNA serves both as genomic and mRNA for these viruses. The 5' may be naked, capped or covalently linked to a VPG protein. The 3' may be either naked or polyadenylated. Upon infection, the genomic/mRNA is translated, often into a polyprotein encoding for replication machinery. 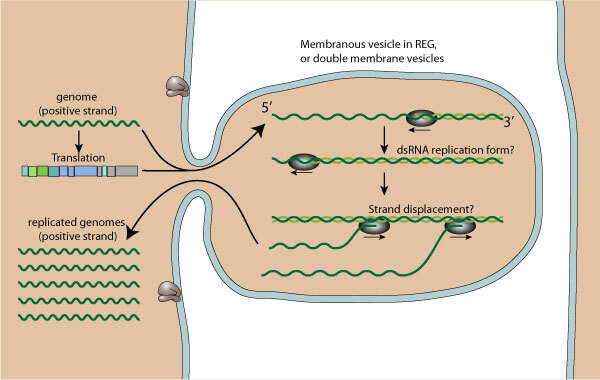 The replication occurs in membranous invaginations of the REG, possibly to avoid dsRNA intermediate detection. Replication of the positive strand presumably leads to dsRNA formation, which in turn will be transcribed into positive single stranded genomic/mRNA. The neo-synthesized RNA may serve either for replication or translation. For many positive stranded RNA virus, subgenomic RNAs are transcribed, often encoding for structural proteins.